The Cincinnati Reds won on Tuesday night, just like they drew it up: On a walk-off wild pitch. The Reds scored twice in the bottom of the 9th to beat the White Sox 6-5. You can see the entire box score for the game right here. Lucas Sims got the start for Cincinnati and allowed two runs on three hits and two walks in 2.2 innings with a strikeout. Zach Duke also allowed two runs on the night in his inning of work. Matt Wisler tossed 1.1 perfect innings with a strikeout. Matt bowman, Sal Romano (two strikeouts), and Robert Stephenson had shutout innings. Cody Reed didn’t allow a base runner, but was charged with an unearned run as the game had the “runner starts on second base” rule in effect, and that runner scored. At the plate it was the Nick Senzel show. He played all nine innings of the game, going 2-5 with two doubles and there runs scored. Joey Votto also went 2-5 and played the entire game until he was replaced for a pinch runner in the bottom of the 9th. Derek Dietrich joined the 2-hit party, going 2-4 with a run scored. Matt Kemp went 1-3 with a walk and a run batted in. Yasiel Puig went 1-4 but made it count, driving in two runs. Jose Peraza also drove in a run, going 1-4 along the way. Nick Senzel went 2-5 with 2 doubles, a steal, and he scored 3 runs. Leandro Santana scored the winning run as a pinch runner on a wild pitch. Reshard Munroe walked in his lone plate appearance. Stuart Fairchild was hit by a pitch, which also brought in the tying run in the 9th. Scheduled to pitch on Wednesday for the Cincinnati Reds: Tanner Roark, Jared Hughes, Anthony Bass, and Wandy Peralta. You got something you want to say? Yeah well I think so. Well get it off your chest. What’s that guy doing on second base? You know that’s a good question. BobSteve looked great last night. The energy/demeanor was more relaxed and less antsy, much in the same way Cody Reed dialed it down a year ago. To me, this is a huge step in his development . The Reds would be foolish to lose this guy before giving him half a season with the big club. Totally agree. Last August something strange happened when after three starts he was banished to the bullpen. Do we know why? Agree. The missing ingredient, command, was present. Wisler and Sims have nice off speed pitches. Bowman looked good, too. That will translate to nice, major league ready depth at Louisville. Senzel continues to show very well in CF. I think we have seven good options for the outfield. To nitpick, I’m a little concerned about the lack of walks by Winker and Senzel. Both appear fully healthy, but I wonder if they are fully back at game speed reading pitches given their relative youth and the significant time they missed due to injury. That said, seven really solid options…some with tremendous upside. What a great place to be as a franchise! I can take it or leave it w reed or bobsteve. They both had plenty of chances to make on of the worst pitching staffs in all of baseball. That being said- showing your hand you want a 13 person pitching staff means they’ll prob keep bobsteve on team at least to start the season. Agree. I noticed Reed was more composed last year and his results were a lot better. I know it’s just one inning but hopefully this mean Stephenson has overcome his jitters. It looks to me like Wisler and BobSteve make the final cut with just two lefties in pen, Garrett and Duke.I really wouldn’t mind seeing Reed rather than Duke, but don’t think it will happen. Stephenson has only pitched once (I think) with 1 IP. He’s also pitched in a minor league game and displayed similarly strong command. Really doesn’t need to be stretched out to pitch from the pen. If he can get in a couple more games, any duration of innings, he will be ready. Plenty of time as number of pitchers in camp continue to decrease.They are not going to give him away by trying to send him down and having someone claim him. He is either on 25 or on DL. Minor league games mean even less than ST games. 1 game 1 IP is not enough. on the staff, behind Hughes with a 2.48 mark. That’s a good thing, especially in GABP The thing that’ll hurts his chances of making the 25 man roster is that he has a couple options left. Don’t pay attention to pitch totals in spring training. They are not accurate. Some stadiums actually track each pitch. Some do not – and in those stadiums any walk is 4 balls and no strikes. Every strikeout is 3 strikes and no balls. Gameday appears to do the same thing with pitch counts and walks and strikeouts during ST. 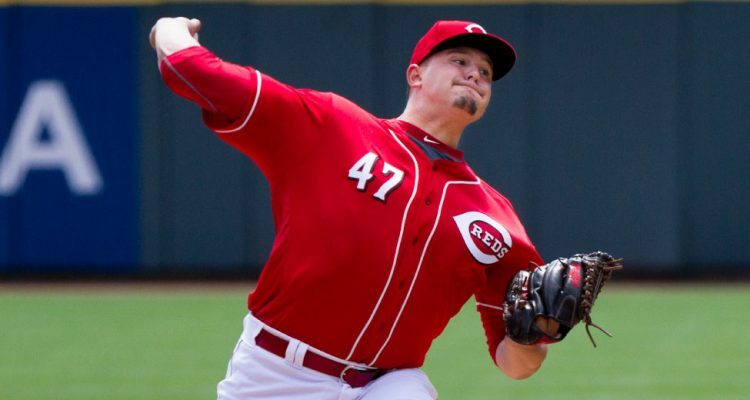 I think Bowman will pitch for Reds this year but he should probably go to Bats or Lookouts for at least a month, pitch a heavy workload of relief to be sure his fingers issues are definitely behind him.